Dean Karsky was appointed to fill a city council seat vacated by City Councilor Bob Litz who was duly elected as County Auditor. 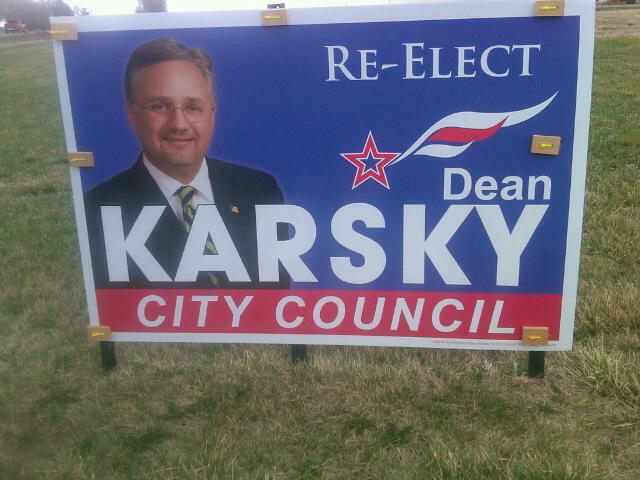 Although Dean Karsky has run for a city council position prior to his appointment to fill the vacated seat, he has never won a city council election in his own right. He has never been "elected" in a city council race. He is running again for a seat on the city council. This campaign sign is troubling. Websters Dictionary defines re-elect as "to elect for another term." 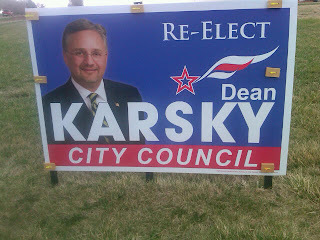 Karsky was never elected to the term of office he is currently holding. He was appointed by the other city councilors to fill a vacant seat. So, what do you think? Isn't this a misleading way to run a campaign? What is the Answer in the Health Care Debate? Finally, we are entering the phase of the Supreme Court decision regarding the constitutionality of the Patient Protection Affordable Care Act signed into law by President Obama on March 23, 2010. If you are listening to the debate regarding the constitutionality of "Obamacare" you immediately see legal argument colliding with emotional argument. There is much about this law that is good. I would hate to see the Supreme Court strike down the entire law because the provision regarding pre-existing conditions and children staying on their parent's plan until age 26 are good provisions of the law. However, it is the individual mandate in this law that has generated such a firestorm of debate. Does everyone need health insurance? Should a person be forced to purchase health insurance? Do you know anyone who has not needed to see a doctor or access health services at one time or another in their lives? I submit to you that the answer is yes to all these questions. Everyone needs health services at one time or another in their lifetime. They can't afford the premiums. They have been denied coverage because of a pre-existing condition. They are young and well and don't think they need it. The problem with the current health care system in this country is that the ones who purchase health insurance coverage end up paying for the ones who choose not to purchase health insurance coverage through their premiums. People don't buy coverage yet they use it anyway through emergency services. It is estimated that 35 million people in this country are without health insurance coverage. You want to know why insurance costs are so high? That's why. Somebody has to pay for all those health services used by the uninsured. That somebody is people who have the coverage and pay the premiums. It also falls to the employers who provide health insurance benefits to their employees. Employers are being buried under the costs of providing those benefits. Healthcare reform is a necessity in this country. The debate is how to get it done. The Republicans, who want to mandate procedures for pregnancy affecting women across this country, find the mandate for individual health care coverage unconstitutional. President Obama was opposed to a personal mandate before he was for it. Republicans were for the mandate in the 1990s. The hypocrisy in this debate is astounding. I am sickened to death with the extremes in both political parties whose screams are drowning out any rational discussion regarding health care reform in this country. When and if the Supreme Court strikes down the individual mandate provision of this law, I hope real healthcare reform can be on the people's agenda. I have listened to the pundits about healthcare reform solutions, i.e., give tax breaks to people who purchase health insurance coverage; allow interstate commerce regarding insurance coverage. The problem is those insurance companies who have monopolies and oppose people's ability to shop anywhere. We elect our representatives to Congress to fix this problem. Quit screaming your extreme right or left positions and actually solve this problem. Quit listening to the financial giants in the health care industry who are only concerned about their own financial gain. Is that too much to ask? It has been interesting to follow the South Dakota High School Activities Association board this past week or so. It should not come as a surprise that the sentiment was to say no to a proposal to move all future state tournaments to Sioux Falls in future years. The article in the ARGUS LEADER today was an interesting read. The heading said, "Sioux Falls' image problem." Our mayor is well tuned to "image" and exhibits the concept of "image" every day through his speeches, press releases, press conferences, his demeanor at council meetings and his listening and learning sessions. His lack of understanding the statewide dynamic concerning the perception of Sioux Falls is troubling. I am no stranger to "Sioux Falls' image problem." After working close to 26 years for the City of Sioux Falls, this concept was no surprise to anyone working for city government. People in surrounding communities and statewide come to Sioux Falls for the shopping, eating, and entertainment experience and they love to come here. The image problem is not about the visitors experience. The image problem, in my opinion, centers around how city and civic leaders interact with the rest of the state. The SD Legislature has not been known as a friend to Sioux Falls. Heck, sometimes the very Senate and House representatives elected in Sioux Falls district races are not advocates for their own city. Working with state government officials over the years was a lesson in frustration at times as well. When Pierre presented the position that they knew better than city officials regarding roads, transportation, traffic engineering needs in Sioux Falls, it taught city officials and leaders lessons in humility and how to effectively work with others. Mayor Huether was not at the SDHSAA meeting this past week. Ok, he was out of town. Why not send city officials with economic responsibilities to represent him at this meeting? This glaring absence of a Sioux Falls city government presence sends a power message to this group and to the people who felt so passionate about the proposal that they attended the meeting to voice their positions and defend and promote their cities. Is it that we are so big and have so much going for us, we don't have to? I submit to you that is the height of arrogance and is disingenuous to others outside our city. The mayor, who was not at the hearing, said that his city has no problem dealing with others, so says the ARGUS LEADER article. If he was at that meeting, he would have experienced the problem first hand. The executive director of the Sioux Falls Convention and Visitors Bureau said, "The whole affair became an exercise in Sioux Falls bashing." Although there were two staff people present at the meeting from the SFCVB, they were told not to address the group because they would only be coming across as defensive saying, "At what point could they have stood up without making the situation worse?" Really? Sending some staffer to sit and listen and not participate or represent the city promotes the very concept of "entitlement". The mayor referred to the new event center as the South Dakota events center in his telephone interview with the ARGUS LEADER. The SFCVB executive director said,"have some vision, take the state to a new level." The Events Center was never promoted as the "South Dakota Events Center". Both statements indicate a lack of understanding for outstate feelings and issues. Everyone knows Sioux Falls is an economic engine for South Dakota. There was a statement in the article that caused me to cringe: People in Sioux Falls are so accustomed to it (referring to economic growth and development) that they barely give it a second thought. It's the mentality "we are, so we can" that permeates outside our city limits and it is that mentality and image that needs to get tapped down by city officials and economic leaders in Sioux Falls. And that means showing up and yes, actually speaking, when Sioux Falls is being discussed in this state. Working effectively with the others is even more important when you are big and growing and seem to have everything going for you. This idea that Sioux Falls doesn't care about other cities in the state is simply not true. We have to stop sitting on the sidelines thinking "we are so great" we don't have to do anything. Does Sunshine Week Shine Bright in Sioux Falls? Below are editorials and some memorable comments by city councilors regarding the open meeting reprimand handed down by the South Dakota Open Meetings Commission last week. You be the judge on whether openness in government shines bright in Sioux Falls. Did Sioux Falls' city government light shine a little dimmer in the state last week? Vernon Brown deserves a medal and here’s why: Brown is upset that the Sioux Falls City Council — of which he is a longtime member — has been given a reprimand by the South Dakota Open Meetings Commission. The commission recently ruled that the council was too vague in its motion to fire former city clerk Debra Owen, who was let go by the panel in a controversial move last year. Brown, in the council’s most recent meeting, said he is pained to have this censure fall upon the board and blamed David Pfeifle, the Sioux Falls city attorney, for providing bad legal advice. Brown did this in open session, and Pfeifle took offense, sparking a feud between the attorney, Brown and at least one other member of the panel. It’s a dramatic issue, no doubt, but we can’t help but appreciate Brown’s stance. First, we remind readers that it’s Sunshine Week, a five-day span set aside by many newspapers in America to promote government openness. Brown’s timing certainly is fitting. It seems that many boards do not take great offense when they are reprimanded by the Open Meetings Commission, a panel that hears public complaints about possible violations of procedure by elected boards. That Brown is so offended shows he cares, and it shows that he truly wants to conduct the people’s business appropriately. We don’t care that his scolding of the city attorney caused offense. If the attorney’s advice was bad and caused embarrassment to the board, so be it. The attorney works for the people; so does the City Council, for that matter. And further, Brown maintains that his role on the board does not trump his First Amendment rights to state his true feelings about this issue. Since this is Sunshine Week, a national observance about the importance of openness and transparency in government, I think it is a good time to give what I call the "Black Hole" Award. Webster's in part defines a black hole as a space that light cannot escape. Certainly true in the case of the Sioux Falls City Council, which last week was reprimanded by the Open Meetings Commission for violating state law. The complaint that went to the open meetings panel was initiated by the Sioux Falls Argus Leader. Last year in a special meeting executive session the Sioux Falls City Council decided to fire the city clerk. The problem: the official action related to the decision to fire the clerk was never conveyed to the public in the official minutes of the Sept. 14 special meeting. Rather, Sioux Falls councilors decided, apparently based on advice from their attorney, to approve this motion following the executive session: "to authorize Councilors Erpenbach, Anderson Jr., and Entenman to take the personnel action that was discussed in Executive Session." The city attorney said the council needed to be non-specific in its motion in order to "protect" city clerk Debra Owen and afford her the same rights as if she was a private employee. Yea, right. Benevolent-sounding, but it appears to be more about city councilors wanting to protect themselves rather than Debra Owen. At any rate, the open meetings commission was right to reprimand the council, and the subsequent media attention has helped put some bite in the reprimand. The Sioux Falls mayor has since said the open meetings laws are "confusing." The Sioux Falls city attorney has said the reprimand is no big deal and he would welcome the opportunity to work with legislators to "clarify" the open meetings law. South Dakota's open meetings laws are pretty clear cut when it comes to taking any official action related to executive session discussions. Public boards in South Dakota generally have operated well under those provisions of the law for 25 years. The law allows public boards to keep discussions and rationales regarding personnel actions in secret. The law is clear that any official action regarding those discussions must be made in public. It also must be clear exactly what those official actions are. Why Sioux Falls city officials suddenly find it confusing is rather amusing. And sad. Nevertheless, the 2012 Sunshine Week "Black Hole" Award is no laughing matter. It's a serious reminder that open government in South Dakota is always a work in progress. "We were wrong. We ought to be contrite." "...yes, I am embarrassed and yes, I apologize to the citizens of Sioux Falls but we did what we thought was right and I will stand on that vote because we did what was right even though the way that it turned out in terms of the open meeting didn't work out the way we thought it should. We did the right thing." "Here again, I am not taking this lightly. Any decision we make affects people. It affects staff, it affects the citizens of Sioux Falls and we don't take it lightly, but we do the best , the very best that we can and I believe we did well here." "I had the privilege of attending that meeting and I guess when they said we violated the law, I am not going to second guess them and you watch the meeting September 14th and read the minutes of the meeting it's about as vague as you can get. I know we were dancing, we were dancing to keep Debra out of the limelight on this whole issue but we practiced some bad form in removing one of our appointed people......It's bad form on our part first but I'd like to know in fact if we have officially ever removed her." "I will answer that. She stood on the Carnegie steps and announced to the media she had been fired and she's been collecting unemployment for 6 months so I think that's pretty official." "The ripple effect of this change is enormous." "We've crossed that center line of the public's right to know and from the person's privacy and that disturbs me quite a bit because we try to be nice a little bit around here and hold that person's ability to and our ability to do some things the right way to do and they forced our hand on this and I don't know if that's the right way to do it or not." "This is the first time we ever removed an appointed personnel from the city council staff and I think we definitely need to make sure that in the future if this ever happens or has to to occur again that we don't end up with the same result." "I guess I'll echo those sentiments." The city council has decided on a new city clerk. Soon they will be picking their new legislative person as well. They have picked an outstanding person for City Clerk. I have worked with Hogstad during my entire career at the city and you will not find a more dedicated, committed individual to run the city clerk's office at Carnegie Town Hall. She spent the majority of her career in the city clerk's office and comes to the job with significant knowledge and expertise in managing the official records of the city. She has spent the last number of years in the City Attorney's office overseeing the liquor license application process - a process that used to be in the City Clerk's office. I wonder if that function will be transferred to the City Clerk operation when she gets appointed? She has extensive administrative experience but no management or supervisory experience. She loses her civil service protection in this new position and becomes an at-will appointive official. At least she will have bumping rights back into civil service if she gets fired, unlike Owens. Although rumor has it the mayor would like to get rid of that bumping provision in city ordinance. It will be important for her to seek out advice and counsel regarding her new “executive and supervisory” position or she could surely find herself in a political firestorm with those 8 city council members and a mayor. I wish her well in her new position. We just learned that the city has lost a very experienced and talented person – Erika Beck – in the planning/economic development field. Beck was the most avid and vocal cheerleader of Downtown. She understood the value of partnerships and building consensus, and she was good at it. She was directly responsible for administering the city’s tax increment finance (TIF) program, property tax abatement programs and the facade easement program downtown. She was very involved in Downtown development activities including managing the core redevelopment efforts for the city. What a loss for the city and for Downtown Sioux Falls. Her shoes are going to be very hard to fill. I was always of the opinion that Beck represented the future of the Planning/Economic Departments. I hope someday she has the opportunity to come back to the City of Sioux Falls in an appointive leadership capacity. The administration is ready to issue some of the bonds for the new event center. These bonds were to be authorized the end of January and it is now middle March. I suppose we should be thankful we haven’t incurred the debt yet. I just remember how the mayor told us how crucial it was to get this on the ballot in November and get this thing moving because construction costs are increasing every day. It is interesting that just the tax exempt bonds relating to $104 million of the entire cost will be issued first. The remaining bonds will have to be issued as taxable and will carry a higher interest rate due to the sponsorship plans with private entities. The citizens were told in November 2011 that the actual bond amount was to be $115 million plus the cost of insurance, capitalized interest and the $9.5 million debt service reserve. If the total cost goes over the $115, what happens then? More than 500 people turned out at two public hearings regarding the railroad relocation project. People are not happy about a new switching yard near Brandon or the routing of trains from downtown out to the southeastern part of town between 57th and 69th streets for a siding alternative. I am not sure what we really learned from the mayor’s press conference. Did he heed the concerns of the people? It sounded like he did and that the southeast alternative is not acceptable to him. It just wasn't said very clearly. People need to remain vigilant on this issue and pressure city officials to come to a reasonable outcome on this project that moves this project forward while not sacrificing the southeast residents and the east corridor of Sioux Falls. I wrote each city council member a letter regarding my position on the Canton side alternative and the negative impact to southeastern city residents and the eastside corridor of Sioux Falls since I was unable to attend the public hearing. I heard back from every council member except Councilors Entenmen and Karsky. I guess those two don't feel it is necessary to acknowledge communications from city constituents or let me know their position. Their silence indicates to me a lack of concern and an arrogance that they are not accountable to the public. The multiple water main breaks in Sioux Falls this past week were troubling. It seems we don’t really know what the cause was for these multiple water main breaks. Was it the draining of water from a water tower or was it an indication of crumbling infrastructure? Water and sewer infrastructure and maintenance needs are financed by user fees. Let’s hope this is not a window into future problems because it will mean costs go up and when costs go up, our fees go up. It will be interesting to hear from city officials as to why this happened and what the solution needs to be. Let’s hope the electronic and print media stay on top of this development and give us a follow-up story/stories. The really big news is the reprimand handed down by the State Open Meetings Commission yesterday for violating open meeting laws when it fired City Clerk Debra Owen last year. I would venture to guess that most people who understand the working of city government knew that action was a violation - everyone except our city attorney that is. Four city/state attorneys from other SD jurisdictions clearly saw it differently than City Attorney Pfeifle. Everyone makes a mistake, but this is a big public one for someone responsible for providing legal advice to city elected officials. This doesn’t exactly instill confidence in the City Attorney's office. Life goes on when you are out of the loop. It is interesting how easy it is to get caught up in your own little world while the rest of the world keeps humming along. It happens to everyone. Families working multiple jobs to make ends meet while dealing with childcare issues don't have the energy to stay in the loop with the world around them. People are busy with their own lives and taking care of their families and don't have time to pay attention to local, state or world affairs. I have a dear friend whose mother has Alzheimer's. She and her sisters jointly care for their dear mother in their homes. Mama stays with one daughter Friday through Tuesday and goes to the other daughter's home Tuesday through Friday. The daughters work together to provide Mama the love and care necessary to make her life livable and surrounded with love. Family tragedies happen every day to someone or some one's family. People suffer emotionally and life goes on. For me, dealing with a parent who has had a stroke and lives two and a half hours away means a lot of windshield time and being away from home for days at a time. And it means being out of loop which is not the norm for me. It is easy to lose track of local and national news when your daily life is consumed by doctors, nurses, therapists and a father who no longer can retain the smallest bit of information for longer than two seconds and doesn't understand what has happened to him. A life changes in a medical instant and results in life altering decisions for both my father and step mother who have been living independently in their own home. The emotional toll on everyone is huge. Physical therapy makes my father's body stronger but speech therapy, music therapy, and occupational therapy cannot repair those breaks in his brain that impact his cognitive skills. Every piece of information must be delivered over and over again as he struggles to understand and comprehend who people are and how he once knew them. Routine gives him piece of mind and a visit can throw his routine completely off. Our visits are not hours, they are days because the thought of leaving him alone to struggle through his new situation is almost more than we all can bear. He doesn't want us to leave and worries about how he will get to the dining room, who will help him get dressed or get ready for bed. He doesn't understand why this has happened to him and why he can't go home. Making life changing decisions regarding their lives means selling a home, finding places for them to live without each other, coming to the realization that you must now take on the parenting of a parent and realizing that it is now your turn to give back to your parent what they have given to you your entire life. That's why they call it "family." Changing roles. Life goes on. It's just different now.